A method to transplant tumours in flies.The revival of an old, but powerful technique. A method to transplant tissue from donor larvae to adult fly hosts, which can be used to study many biological processes including malignant growth. 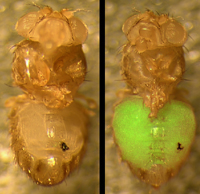 In 2002, when facing a major technical problem, the Gonzalez group took advantage of two of the many benefits of using the vinegar fly, Drosophila melanogaster, for scientific research: the variety of methods and tools generated over more than a century of work with this fascinating organism, and the culture of sharing that is deeply rooted in the Drosophila research community. The problem was to carry out in flies an assay that is standard to investigate cancer in mammals, including humans, which consist in transplanting the tumour mass to mice; implanted healthy tissues cannot overgrow, but malignant tumours grow without limit and kill the host. The solution seemed simple because, indeed, among the battery of methods developed by fly researchers there is a technique for tissue transplantation. But there still was a problem. The technique, developed around 1935, was used extensively in the following decades, but for some reason it fell into disuse and nearly died out by the end of last century. To make things worse, published details on the protocol were scarce. The result was that by 2002 only a handful of Drosophila specialists around the world kept this precious know-how. Prominently, among them was János Szabad, a Professor at the University of Szeged (Hungary); and it was him who solved the second problem by kindly hosting and demonstrating the technique to Gonzalez. Since then, not only has the Gonzalez group has exploited this method in their studies of malignant growth and cancer modeling in flies; they have also hosted and demonstrated the technique to scientists from USA, Australia, India, and Europe who have come to their laboratory at IRB Barcelona. The method is actually rather simple: the tissue of interest is dissected, loaded into a fine, purpose-shaped, glass needle, and injected into a host. But there are plenty of small details, from the making and shaping of the needle to looking after the implanted hosts, that are easy to perform when learnt from an expert, but difficult enough to reproduce without guidance. In their article, Rossi, a postdoctoral researcher in the group, and Gonzalez provide a detailed account of all the materials, equipment, and methods needed to easily and efficiently implement the protocol. The article is linked to explanatory videos that demonstrate every step of the procedure. Altogether, text and videos will allow interested Drosophila laboratories anywhere in the world to make use this powerful technique. Besides malignant growth, many other important problems in cell and developmental biology like, for instance, tissue regeneration, can be approached in Drosophila by this, nearly one century-old technique, which was about to die, but is now thankfully rescued for posterity. PUBLISHED IN Rossi F. and Gonzalez C. (2015). Studying tumor growth in Drosophila using the tissue allograft method.Nature Protocols. Oct;10(10):1525-34. doi: 10.1038/nprot.2015.096. Epub 2015 Sep 10.